Life is a series of up and downs and we never quite know when one of those unwelcome down moments will pop up. Waking up in beautiful Ross Castle today, my family was overwhelmed with feelings of happiness, gratitude and joy. We had experienced a magical Christmas week in God’s country with the entire Powers family – a dream come true for my dad and his family. Early morning tears filled our eyes as we parted ways for various destinations (US, County Cork and London) and our family unit split apart for the first time in eight days. Pulling out of the castle grounds, the kids and I felt confident that the ride to Shannon airport would be quick and uneventful. The sky was dark, the air was mild and our hearts were intent on getting home to Peter who had spent Christmas with his mom and the Schiller family on this first holiday without his beloved dad. Then came one of those down moments. Driving through the lovely little village of Moycullen, our rental car hit a partition in the road and we immediately got a flat tire. (Yes, this was my fault…) After a moment of panic, I said “no worries, it’s only 8:15 am and I have Avis insurance, we will be on our way soon to make our noon flight.” I secretly applauded myself for securing the daily insurance as I had questioned the extra cash outlay it had cost us. Then things went downhill very quickly. After an hour and a half, we had still not been “rescued” from our village location due to a series of fumbles on the part of Avis. We all stayed calm to some extent and finally got on our way at the late hour of 10:00 am with the help of a taxi and my brother’s family via their big van which was heading south to County Cork. Sitting in the front of the taxi, I thought of my mom and wondered what she would do in this situation. I realized she would do nothing but remain calm because it was out of her control. So that is what I tried to do. Then the unexpected happened…again. The taxi driver and I struck up the loveliest conversation about family, faith and Irish struggles over the years like the famine. He was an elderly gentlemen who had seen a few things in life, and was kind and calming – someone I truly enjoyed being with. He drove quickly, assuring me we would make the flight despite the late hour. At one point he looked over at me and said “In the Irish language we would not call this a disaster, we would say it could be all for luck.” His smile warmed my heart and I understood what he meant. Life does throw us detours but not all of them are intended for our annoyance or harm. We need eyes of faith to look deeply at what is being sent our way to see if perhaps the unplanned path is a better way meant for our good. Meeting Joe was a final treasure that this beautiful country of Ireland had offered to me this Christmas and I will be forever grateful. We stopped at the historic Kylemore Abbey, which was once the home of the Henry family in the late 1800’s. The castle and grounds were extraordinary and added to our vision of heaven on earth. On the grounds of this famous gem in the heart of Connemara, lay an impressive Gothic Church which Mr. Henry had built out of undying love for his late wife. All fourteen of us entered and prayed in quiet contemplation, thanking God for whatever was on our hearts. It was a special moment of the trip when our souls were joined as one in prayerful union to God. Heading out early again the next day, John picked us up at 9:00 for our trip through the Burren and Cliffs of Moher. This was more than just another December day, it was my Emma Rose’s 20th birthday so we celebrated in style on our mini bus and throughout the day. Ireland is a country imbedded in Emma’s heart from all her years of Irish dancing here; I suspect she will one day be back to stay for more than just a week. We stopped along the route for gourmet chocolate, gorgeous water scenes and lunch in a beautiful seaside town. Lahinch is famous for having one of the finest golf courses in all of Ireland. But we had no time for golf and happily visited the best local restaurant overlooking the sea to enjoy fish & chips and a local pint. The younger kids in our group went down to the beach to explore, finding some unique Irish sea creatures for all to enjoy! As is typical in Ireland, the weather changed quickly, growing dark and cloudy after our lunch. We hurried on to our final destination of the day with the hope that our views would not be distorted. Arriving at the Cliffs of Moher was exciting! We needed our rain gear and warm coats as the temperature had dropped with the change in weather. As we ascended the hill to peek over the ridge, we all caught our breadth at the amazing views before us. It was astonishing to realize that these cliffs were formed over 300 million years ago and we were here to benefit from all of God’s handiwork. Emma’s birthday ended with a bang – pizza and cake from the town’s pizzeria and bakery. I don’t think she will every forget the excitement, love and beauty of her 20th birthday! As we were packing up in preparation for departure, I noticed my dad and sister chatting. I poked my head into the room to discover their conversation was centered on my parents last visit to Ireland and dad’s upcoming visit to the town of his ancestry. My dad also had a photo of my mom from their last visit to Ireland twenty years ago. (see below) I marveled at how young and beautiful mom looked. Gazing at her photo helped me to realize the TRUE gift of this trip. Shortly before mom went home to God, she made one request of me. “Write about our family…our love and what a great family we are.” At the time, I didn’t know why she was making this request as I was too caught up in grief and utter sadness. After this trip, I think I understand it a little better now. Mom was wise and she knew the importance of faith and family in this life. Family is here to love and support one another forever. We may not always get it right but we always keep trying. I experienced that this week – so much love and support for my back pain. I felt truly loved by every member of our family. Since arriving home, I realize that I need to cherish the gift of family more and remind each person in my life that I love them unconditionally. I need to model the love of my mom just a bit better each day. 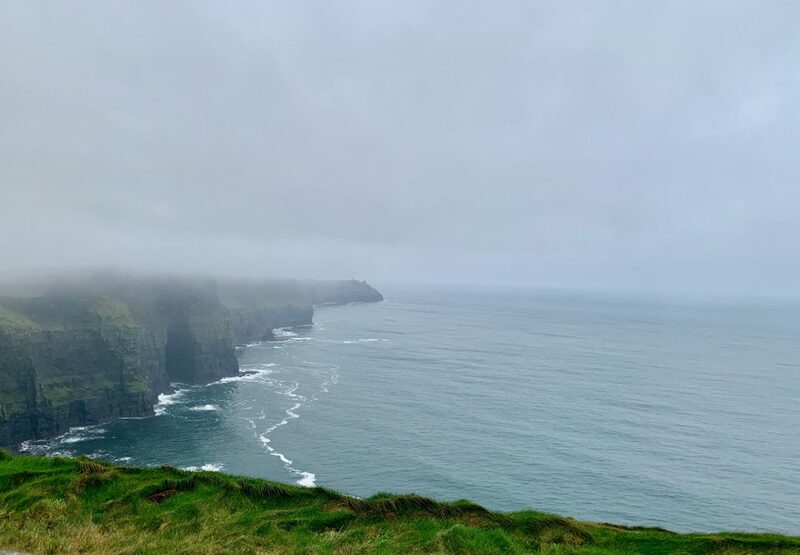 All of the people and experiences that I encountered during my week in Ireland have helped me to realize this – even the flat tire on the way to the airport. Perhaps for New Years, we call all resolve to love our families more and be thankful for the gift of family. Let’s not focus on what isn’t perfect, rather let’s focus on what is blessed by God and work together on the rest. I’m pretty sure that is what my beloved mom was telling me shortly before God called her home. Sage words from a woman whom we were all fortunate and blessed to love in this life and whom we all look forward to loving in heaven.